The chalice on the center of the altar was given by the pope to the third Archbishop of Baltimore nearly two centuries ago. The local welcome crew wore vests that included the outline of a Chesapeake blue crab. 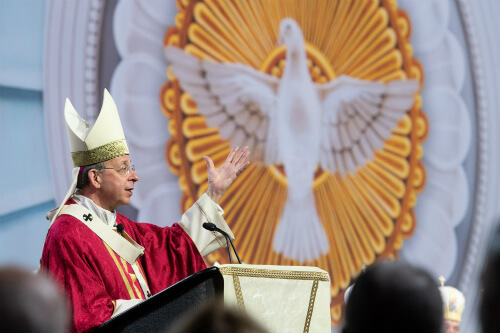 Visitors to the 136th annual Supreme Convention of the Knights of Columbus got both boisterous and subtle reminders of their location the morning of Aug. 7, when Archbishop William E. Lori, their supreme chaplain, was the principal celebrant for the gathering’s opening Mass. 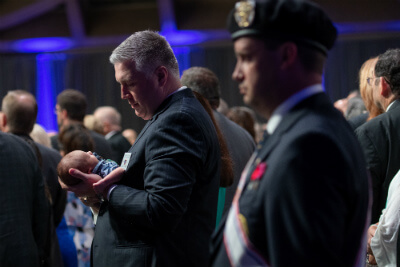 Held in a ballroom at the Baltimore Convention Center more accustomed to boat shows, the liturgy was offered against a backdrop that incorporated an image of the dome of the Basilica of the National Shrine of the Assumption of the Blessed Virgin Mary. It was a familiar sight to those Knights and their families, primarily from across North America but from far away as the Philippines, who might have already visited America’s first cathedral, a little more than a half-mile to the north. In his homily, Archbishop Lori mentioned those who came to Southern Maryland from England in 1634 seeking freedom from religious persecution, and the Knights’ founder, Father Michael J. McGivney, who was ordained at the Baltimore Basilica in 1877. According to the Mass program, during that ordination Cardinal James Gibbons “likely” used the aforementioned chalice, a gift from Pope Pius VII to Archbishop Ambrose Maréchal in 1822, a year after the Baltimore Basilica was dedicated. Supreme Knight Carl Anderson, in remarks given later that day, reported that the order’s charitable contributions in fraternal year 2017-18 totaled a record $185 million. That figure does not include a $1 million gift presented to the Archdiocese of Baltimore Aug. 4, toward a project that will give Baltimore City its first new Catholic school in nearly six decades. “Knights of Charity” is the theme of the first supreme convention in Baltimore since 1989, when the Archdiocese of Baltimore, the first diocese in the U.S., celebrated its bicentennial. The opening Mass included 100 bishops and 200 priests. Concelebrants included Cardinal Daniel N. DiNardo, Archbishop of Galveston-Houston and president of the U.S. Conference of Catholic Bishops, and Boston Cardinal Seán Patrick O’Malley, a Capuchin who is president of the Pontifical Commission for the Protection of Minors. Archbishop Lori alluded to the recent demotion of Archbishop Theodore McCarrick from the College of Cardinals and a soon-to-be-released Pennsylvania grand jury report about the cover-up of child abuse in the church. Prelates with ties to Baltimore included Cardinal Edwin F. O’Brien, archbishop emeritus of Baltimore and grand master of the Equestrian Order of the Holy Sepulcher; Wilmington, Del. ; Bishop W. Francis Malooly; Springfield, Mass. ; Bishop Mitchell T. Rozanski; and auxiliary Bishops Adam J. Parker and Mark E. Brennan. Concelebrants included Father Michael A. DeAscanis, pastor of St. Philip Neri in Linthicum Heights and St. Clement in Lansdowne; Father Warren Tanghe, pastor of St. Paul in Ellicott City; and Conventual Franciscan Father Donald Grzymski, president of Archbishop Curley High School and past chaplain of the Maryland State Council. Some of that council’s members were visible for their custom red nylon vests, which included the outline of a crab on the back. 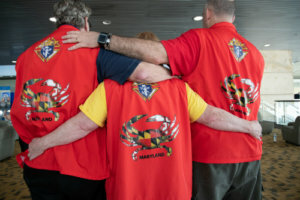 In lieu of blue, its color scheme was the Maryland flag. 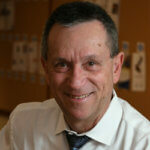 Stephen J. Bayliff, recognitions programs chairman for the Maryland State Council, did not need a conversation-starter. As Knights took an escalator down to Mass, Bayliff greeted each and every one by name and with a hearty handshake. Bayliff is a member of Jesus the Divine Word Council 14775 in Huntingtown. In 2000 he moved from Midland, Texas, to Southern Maryland, and soon thereafter became a Knight. 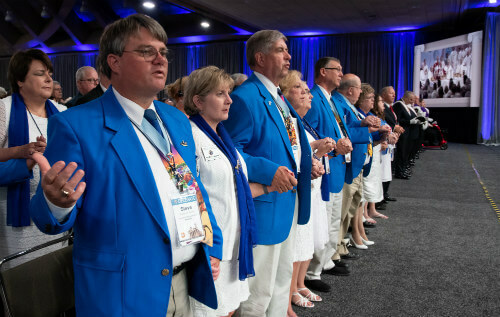 The approximately 2,200 Knights and their wives in attendance included first-time conventioneers Bret and Courtney Ladenburger, of Casper, Wyo. A Knight since 1994, when he turned 18, Ladenburger is the state secretary for Wyoming, where the March for Life is held in Cheyenne and the Winter Special Olympics in Jackson. Larry Lewandowski, past state deputy for North Dakota, is a convention regular. His first thought when he heard the 2018 convention would be in Baltimore was Johnny Unitas, the late Pro Football Hall of Fame quarterback – and Catholic, to boot. Having spent 25 years in the U.S. Air Force, Lewandowski likens the Knights to a military outfit. Lewandowski described the fellowship he found at breakfast that morning.